Pets provide us with hours of fun, as well as unconditional love and companionship, but they can’t always make it clear when they have a problem. 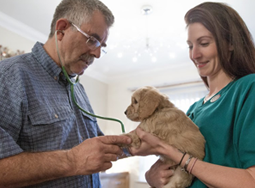 It’s therefore really important that you bring them in to see us for a regular health check so that we can ensure they stay happy and healthy, and that any early concerns can be addressed before they become serious. When your pet is young, we recommend that they have a full health check every 6 months as they grow and develop so quickly. After they are a year old, they should have a check-up with a vet at least once a year, normally at the same time as they receive their booster vaccinations. During a health check your pet will be examined from nose to tail, including their eyes, ears, mouth and teeth, skin, coat, paws and claws. Your vet will also listen to their heart and lungs, and have a good feel of their stomach to make sure there are no unusual lumps and bumps. Your vet will then explain any findings, as well as the possible options for treatment if necessary. If everything is as it should be and your pet is happy and healthy, you will simply be invited to make an appointment for their next health check. Please feel free to use these check-up appointments to ask your vet about any concerns you may have with your pet. They will always be more than happy to explain any observations to you, as well as all possible options open to you and your pet.